At UN, France's Araud Refuses Question on Mistral Ship Sale to Russia, "Not UN"
UNITED NATIONS, January 28 -- When one of the five permanent members of the UN Security Council seeks to sell high tech warships to another of the P-5, against the interests of a smaller country which is on the Council's agenda, isn't it a UN relevant matter, even if the seller's Ambassador says "no" as he walks away from a question about it? France has moved to sell Mistral class warships to Russia, whose war with Georgia over South Ossetia was debated in the Council, and mediated by French President Nicolas Sarkozy. On January 28, as France's Permanent Representative Gerard Araud was talking questions from reporters at the Council stakeout on topics ranging from Cote d'Ivoire to Iran and Chad, Inner City Press asked "about the Mistral." Video here, at Minute 6:25. Araud immediately walked away from the microphone and UN Television camera. "That's not the UN," he said. But isn't it? 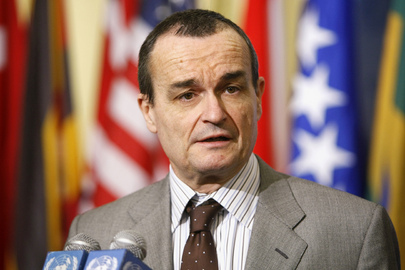 France and Araud take over the presidency of the Security Council in February. As such, to read out press statements and provide summaries of Council consultations, Araud will be at the stakeout more frequently. Whether he will stick to this narrow definition of "the UN" remains to be seen. UNITED NATIONS, January 28 -- Just as the motorcade of U.S. President Barack Obama left Capitol Hill on Wednesday night after his State of the Union speech, a coalition of Darfur activists issued a press release expressing "disappointment that President Obama did not highlight Darfur, Sudan or genocide prevention during his State of the Union address.... 'We are very far from the unstinting resolve on Sudan that President Obama promised in the campaign.'" The next morning at the UN in New York, when U.S. Ambassador Susan Rice, a "long time friend" of Mr. Obama, stepped to the Security Council stakeout microphone to speak about Somalia and Ivory Coast, Inner City Press asked her about the activists' disappointment. Were they misreading the omission of Sudan and genocide from the lengthy speech as reflecting a lessing of commitment on these issues by the Obama administration? Yes, Ambassador Rice said, this is a misinterpretation. She said the speech has correctly focused on jobs and the American economy, not every foreign policy issue could be mentioned. She said the Administration remains "deeply committed," and mentioned for the second time this week the work of U.S. envoy on Sudan Scott Gration. Video here, transcript below. 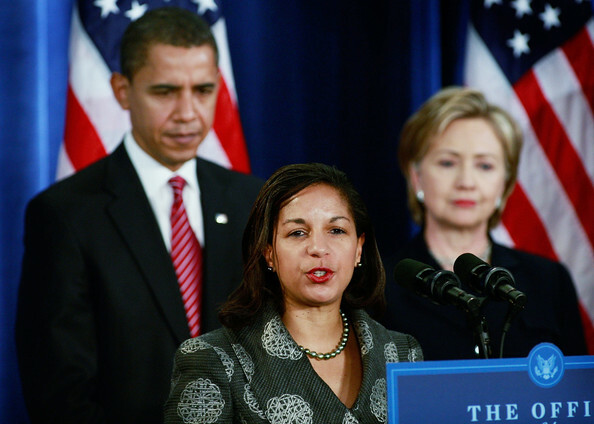 That Ambassador Rice has spoken to the press at the UN twice this week is "something of a record," one reporter noted. The Mission is known to have bristled at recent negative coverage. Inner City Press has previously documented the fall off in media access and U.S. advocacy since Ms. Rice arrived at the Mission, and has been told 2010 may be different. We'll see. Footnotes: on Ivory Coast, when Inner City Press asked if the U.S. agrees with holdover President Laurent Gbagbo about the over 400,000 names on the voter list that he is contesting, Ambassador Rice said there was an incident of a "false list." The UN has not acknowledged that the list is false, and France has only said that it, like all other complaints, should be investigated. So is it the U.S. position that the list is false? If so, cynics might say that the U.S. backs up Gbagbo more and more, to gain even more influence in Abidjan assuming Gbagbo remains in power. On the anti-corruption front, Inner City Press recently exposed and got confirmed that the nephew of the UN's top envoy in Ivory Coast then got employed by the UN system in the country, which even UN investigators have described to Inner City Press as highly problematic. But has the U.S. Mission said anything about this? Or about the even longer standing nepotism problem surrounded the UN's Congo envoy Alan Doss? We will follow this. Inner City Press: On Cote d'Ivoire, does the US have a view: President Gbagbo has said that there's almost half a million improperly registered people and he has called for investigations. They say that's why it's being delayed. Do you have a view as to whether that is a legitimate claim? And just one other I wanted to ask you, the Save Darfur Coalition took somehow umbrage that last night's State of the Union address did not mention Darfur, Sudan or genocide prevention. Are they misreading that? Does this reflect any lessoning of a commitment? Ambassador Rice: Absolutely not. I think if that is their interpretation I would characterize that as a misreading. I think as all Americans saw and all Americans feel, the President's focus last night was appropriately, principally on jobs and the economy. And the very concrete steps that he is taking and that he is calling on Congress to take to put our economy back on track and put Americans back to work. It was the right focus and clearly not every foreign policy issue of consequence was dealt with or could have been addressed in that context. The President is deeply committed to ending the killing and the suffering and the genocide in Darfur, and our work here at the United Nations and indeed the work that General Scott Gration and that the U.S. Government is doing to try to end the conflict and ensure the protection of civilians is as important today and yesterday as it is any other day. Coming to Cote d'Ivoire, as you know the elections have been delayed repeatedly. This is a source of real concern for the United States and for the Security Council. There was a very unfortunate incident in which a false voter list was released and that has set back the process further. It is our view that the steps need to be taken by the Ivoirian authorities to ensure that the elections happen properly but that also the conditions for it are as such that the people of Cote d'Ivoire can all participate, that all eligible voters are allowed to cast their ballots, and that it happens in a transparent and legitimate fashion.